A power of attorney (POA) allows you to designate another person to make important legal decisions for you if you are unable to do so yourself. This document is a pertinent part of estate planning, as well as binding way to enable your family members’ control of familial assets and your health in the event of an emergency or death. Attorney John Bovill III has helped many couples and families designate powers of attorney that protect them and their interests in difficult times. We are happy to do the same for you and yours. 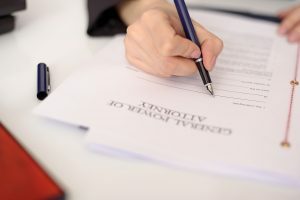 There are different types of powers of attorney, but, at their core, they are legally binding documents that grant permission to a person of your choosing to make specific decisions on your behalf. These powers can apply to healthcare, business, general asset management decisions, and more. They can be as detailed or vague as you like and are completely personalized to you and your family. Non-Durable: These are specific or short-term powers of attorney. They usually grant permission for one purpose or transaction and are nullified once that action is complete. Ex. Permission to operate the trustee’s business until they recover from a major surgery. Durable: Durable powers of attorney are much more comprehensive and all-encompassing. They are typically for long-term goals. Ex. Permission to manage assets and make healthcare decisions for the trustee following a dementia diagnosis and in effect until their death. Limited: Limited powers of attorney are highly-specific and for short- or one-time purposes, such as a real estate transaction. Medical: These POA grant permission for a spouse or other family member to make medical decision on behalf of the trustee should they become mentally incapacitated. Springing: Springing POA go into effect only if a specific condition arises and is in effect only while that condition lasts. Ex. The ability to make medical decisions for the trustee’s minor children while they are out of the country or unreachable. Creating powers of attorney while you’re healthy and of sound mind is one of the kindest things you can do for yourself and your family. Having appropriate measures in place before anything goes wrong removes much of the stress and legal difficulties that can arise in emergency situations. Let us help you plan for the future. Attorney John Bovill III produces actionable powers of attorney for clients in Saginaw, Bay, and Midland counties. If you are in need of a power of attorney, contact our Saginaw office today at (989) 792-4648 to schedule a free consultation with our skilled lawyer.